Cut each strawberry into slices. 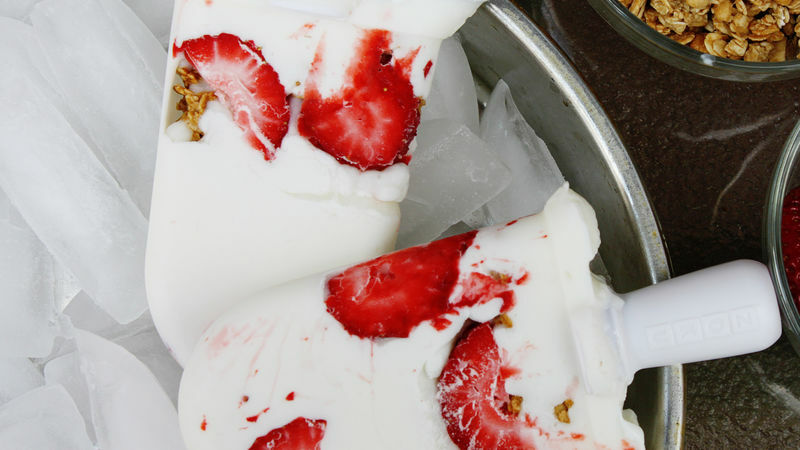 Apply strawberry slices to inside walls of 4 molds in quick-frozen ice pop maker (Zoku™). Insert pop sticks. Pour about 1 ounce (2 tablespoons) yogurt mixture into each mold. Freeze 3 to 4 minutes. Add thin layer of granola to each mold. Pour yogurt mixture to “fill” line of each mold. Freeze completely. Follow manufacturer’s instructions for removing pops. Feel free to change up the fruit or flavor of the yogurt to your taste!